Mary DeMuth challenged her readers to ask God to give them a picture for 2012; I liked Mary’s lilac photo—could almost smell them. I thought, “I have many photos of flowers, I’ll choose one of those,” but flowers were not God’s picture for me. In 2011, God’s picture for me was the Great Wall of China—climbing half-way up the Great Wall was proof that He had miraculously healed me on November 21, 2010 of fibromyalgia and chronic fatigue syndrome. Climbing the Great Wall would not have been a possibility or even a thought without the Lord’s healing touch. Proving the healing was God’s vision for me in 2011. An eagle is God’s picture for me for 2012. This eagle is high on top of a ship, alone, scanning the area for possible food. For 2012, I will be alone with God in prayer and listening for the possible direction that He wants me to take. 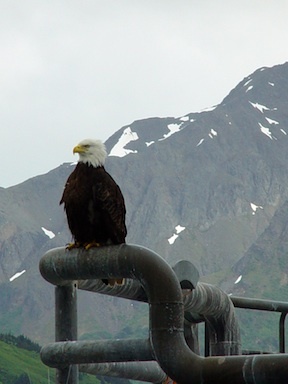 This eagle is poised high up in the cold with the wind blowing her feathers; she’s perched on a ship in Alaska, away from the comfort of her home nest, perhaps the mountains behind her. The Lord is taking me away from the comfort of what I know how to do and giving me challenges I’ve never faced, but I am poised to take those challenges. This eagle is prepared for the next possibility. She has plunged down to grasp her prey many times. The Lord is preparing me for the next possibility through prayer, study, and practice. This eagle is powerful. She makes her nest high in the mountains, and she soars high in the thin air. She “stirs up her nest, flutters over her young, spreads abroad her wings, takes them, bears them on her wings” Deuteronomy 32:11. Jesus promises that we “will receive power when the Holy Spirit has come upon you; and you shall be My witnesses both in Jerusalem, and in all Judea and Samaria and even to the remotest part of the earth.” Acts 1:8 This is my heart’s desire, to be His witness. Is it your heart’s desire? I pray that you will be “strengthened with all power, according to His glorious might, for the attaining of all steadfastness and patience; joyously giving thanks to the Father, who has qualified us to share in the inheritance of the saints in Light” (1 Colossians 1:11-12). May the Father of Lights fill 2012 with blessed prayer as you poise to prepare for the power that He holds out to you alone. Show us what God’s picture is for your 2012. Came over from Mary’s site….Praise God for healing! Your eagle, and scanning to see where God will lead you next…that was me for the past few years. I think I finally have a direction to go. Now it’s up to me to actually go! My picture relates to story…to listening to others, to telling my own, to living my own. Which also relates to jumping in (or off) and going where God wants me! Thank you for your comments and for the link to your picture. It is amazing and truly inspiring to stop and listen to others’ stories and remember that God loves each of these people. It is difficult to grasp that God wants to be involved in each person’s story and is guiding His children in the great symphony called eternity. May the Lord’s picture for you be filled with this eternal symphony and heavenly melodies. Thank you for your gracious words and your blessing. May the Lord fill 2012 with His great and precious promises and blessings for you and your family. what a beautiful picture as you enter 2012 filled with promises and possibilities. God’s blessing be upon you. ← What is your memorial before the Lord?